The first meeting of the caucus is scheduled for June 9 in Tucson, with a Phoenix meeting to be scheduled then. The signers are Senators Al Melvin, Sylvia Allen, and Steve Smith, and Representatives Frank Pratt, Russ Jones, and Terri Proud. • ARPA member companies employ 6,124 workers who provide materials for an additional 112,361 workers in the Arizona construction industry. • payrolls totaled $552.6 million and taxes and fees paid to state, local, and federal governments totaled $98.9 million. • industry purchases of goods, services, materials, and supplies from other Arizona businesses were $956.2 million. • direct output, production and deliveries of the Arizona Rock Products industry was $1.6 billion and the total economic impact was $2.9 billion. • this information is based on a 61% reduction of output since 2006 due to the current economic conditions. COAL: The coal mining industry provides over 400 direct jobs in northeastern Arizona. The coal industry injected nearly $109 million into Arizona in 2010. Tribal economies have benefited from $92 million while the State of Arizona and Navajo County have received a combined $17 million in annual taxes. GOLD: Copperstone Gold will restart production in 2011, and Gold Road Mine started production in August 2010. 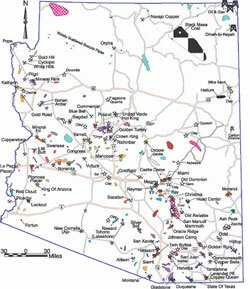 POTASH: Although potash mining is not currently being done in Arizona, the Holbrook Basin is estimated to have a reserve of 1 billion tons of potash. Arizona leads the U.S. in value of nonfuel minerals produced, primarily because of copper deposits. With gold at $1500 per ounce, the Silver State, Nevada, could temporarily bump us into second place. AZ's mineral resources provide much-needed jobs and tax revenues for State, county, and local governments. It's encouraging that the State legislature recognizes the importance of Arizona's mineral resources and, hopefully, will take actions to ensure that they are used wisely in accordance with the many laws and regulations that protect our land, water, and air quality. The Federal government seems to be looking for ways to restrict mineral and energy production from Federal lands, including in Arizona. In addition to lost revenue, this means that we have to import these resources from other countries, instead of using our own. That doesn't make a lot of sense to me. Why don't these legislators ask their constituents what they think about mining. The proposed Rosemont Mine threatens the water source for Tuscon. It will turn SCENIC HIGHWAY 83 into a haul road with a beautiful view of tailings piles. Wildcat Silvers planned mine in the Patagonia's will draw 750000 gals of water/day and threathen Patagonia's water supply. I guess our Congressman have forgotten that we live in an arid climate and have been in a drought for the last 11 years. I wonder if they where to disclose who contributed to their campaigns, we would understand their disire to promote mining.